Published 10/20/2013 . Last updated 4/4/2019 . This best vanilla cake recipe has been years in the making! While a yellow cake or a white cake can be the same as a vanilla cake, my best vanilla cake recipe is differentiated by the fact that it has a strong vanilla flavor – it has real vanilla beans in the batter and gobs of vanilla extract. It tastes like the very best vanilla bean ice cream in cake format! When I posted the Best Vanilla Cupcake Recipe, I was asked about converting the Best Vanilla Cupcake into the Ultimate Best Vanilla Cake recipe at least twice a month. That post has over 400 comments, most of them talking about how it’s one of the best vanilla cupcake recipes ever. It’s definitely my favorite vanilla cupcake recipe and I’ve used it as a base recipe for countless other cupcake recipes. 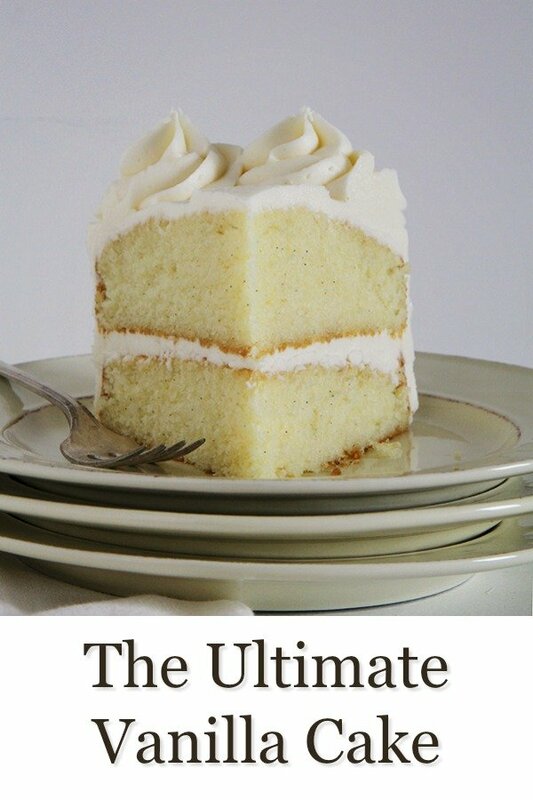 So, of course, readers always want to know how much cake the recipe would make and if anything would need to be changed about the recipe when converting it to the Ultimate Best Vanilla Cake recipe. At the time, I didn’t make cakes at all; I only made cupcakes. So, instead of saying, “Sorry, I’m not really sure,” I decided to turn to a cake baking expert for some help. I let the incredible Amanda of iambaker take over Cupcake Project to answer your questions and to share her experience converting my vanilla cupcakes to vanilla cake. Thank you so much, Stefani, for letting me hang out in your beautiful online home today! I am honored to have been able to contribute some insight into your Ultimate Vanilla Cupcake recipe because, seriously, it is amazing! Stefani thought it would be a great idea to convert her world-famous recipe into the Ultimate Best Vanilla Cake recipe and I can’t help but think that is brilliant. On my blog, iambaker, I make a lot of cakes. I have tried more vanilla cake recipes then I care to admit and have only been truly satisfied a few times. I would definitely rank this recipe as one of the best vanilla cakes I have ever had! All in all, I would say that this is a fantastic and delicious cake. Thanks so much for your generous hospitality, Stefani! Before I share the recipe, I want to clear up a few questions that people have about vanilla cake. After lots of trial and error, I learned that a mix of butter and oil made for the lightest cake while still maintaining a great flavor. Also, using cake flour instead of all-purpose flour helps to lighten up the cake. Cake flour is milled from soft wheat and contains the lowest amount of protein when compared to other flours, around 5 to 8%. I recipe tested this recipe with cake and all-purpose flour and the cake flour made a huge difference. Yes! You can replace the sour cream in this recipe with Greek yogurt. I did a ton of testing on replacing sour cream with Greek yogurt and found that you can barely tell the difference. What is the Best Frosting for Vanilla Cake? If you want to stick with the full-on vanilla experience with your best vanilla cake recipe, I suggest frosting this vanilla cake with vanilla frosting. My vanilla frosting loaded with actual vanilla beans so it tastes like a melted vanilla ice cream and you won’t find a homemade frosting that is easier to make. You might also like trying rolling this cake in sprinkles to make a sprinkle cake! It’s such a fun holiday or birthday cake idea. This is the best vanilla cake you will ever have! Add the egg mixture to the flour mixture and beat on medium speed until just combined. Be sure to scrape down the sides of the mixture as needed to make sure that everything is incorporated into the batter. Divide the batter evenly between two 8" round cake pans. Bake for 18 minutes and then test to see if they are done. They are done when a toothpick comes out without wet batter stuck to it. The cakes should appear white with specks of vanilla bean. They should not turn a golden brown. If they are not done, test again in two minutes. If they are still not done, test again in another two minutes. When the cakes are done, place them on a cooling rack (or just on your counter if you don't own a cooling rack) to cool to room temperature. Then, refrigerate before frosting.